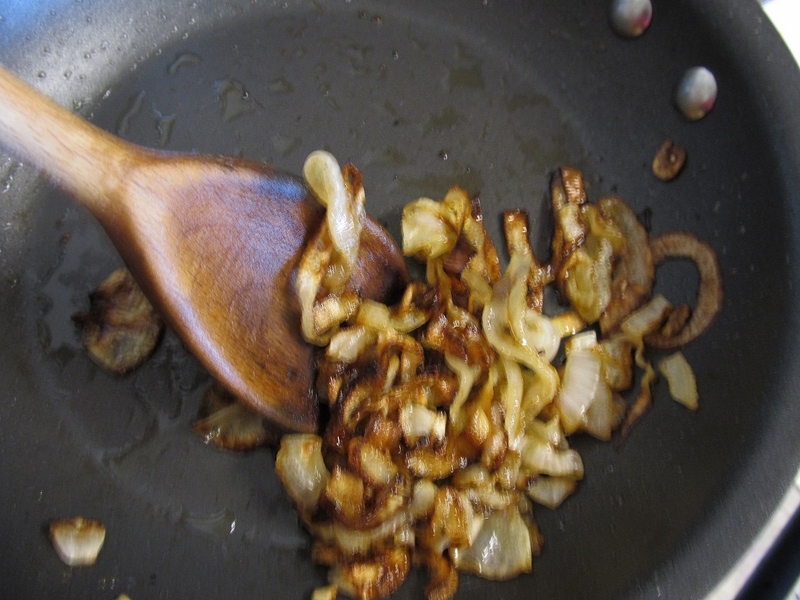 Caramelizing onions | Cooking Ripe! 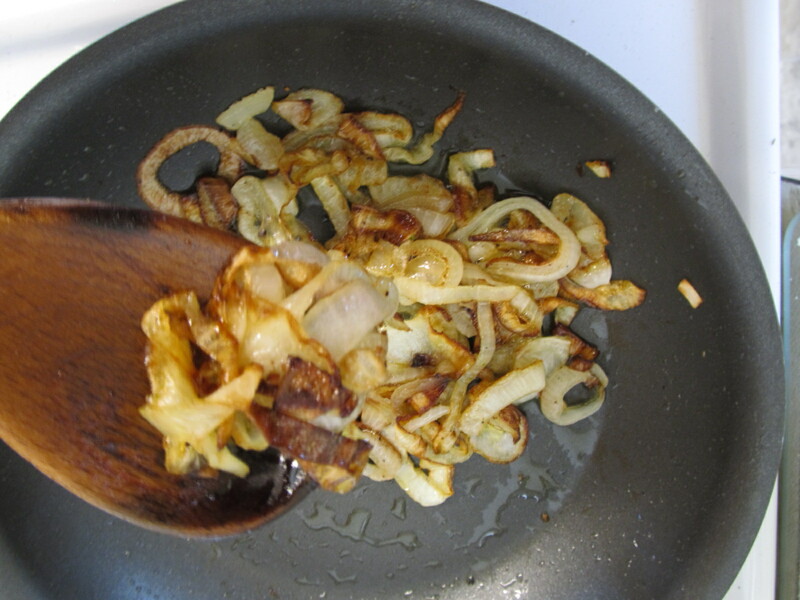 Caramelizing Onions – Oh, how sweet it is! 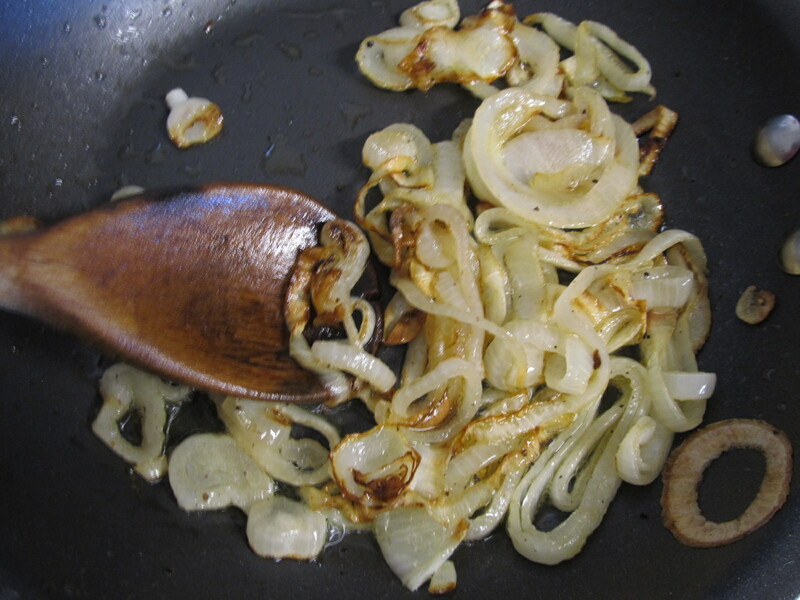 I never really knew what caramelized onions were – or cared. Then, I accidentally made them one night when I was making brats for the Hubs and wanted to put some cooked onions on top. I chopped up the onions and got them cooking in a little EVOO. Then the Hubs called and said he was running late, so I turned the onions down really low and just let them simmer. I stirred them as I wandered through the kitchen occasionally, but generally ignored them. I don’t remember how late the Hubs was, and thereby how long the onions cooked, but it was a spell. When I finally put them on the brats (mine was really a chicken sausage), the most amazing sweetness came through with the mild onion flavor. WOW! Who knew? Apparently a lot of people knew because it’s a standard cooking trick, but I figure that if I didn’t know how to do it, then other people may not either. 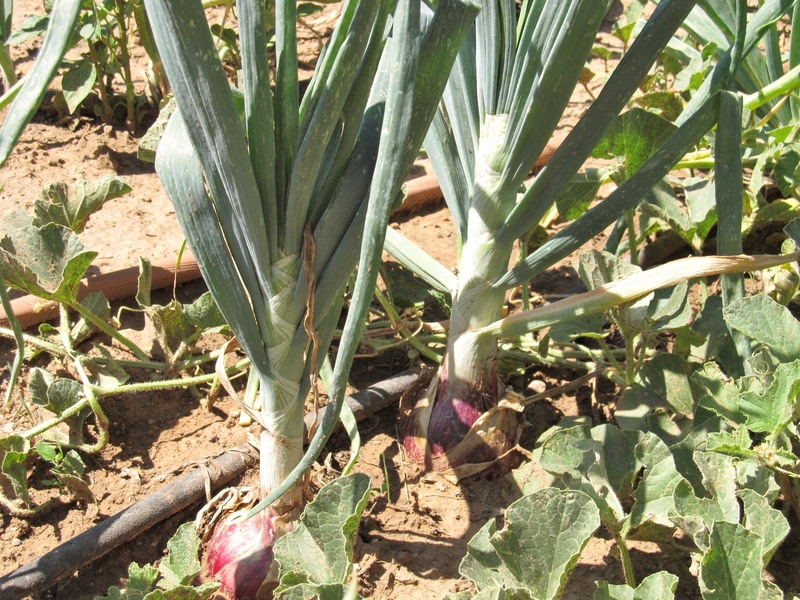 I have a bunch of onions hanging out in the dirt in the backyard and soon I’ll be harvesting and curing them for winter storage. While I let them finish maturing, I have pulled a few to use in my daily cooking. They are so pungent and fresh tasting. They even make me cry when I chop them and I haven’t cried over onions in years. Oh, and the stalks are wonderful to chop up and use like green onions. I’m sure there are whole recipes devoted to the stalks, but I have more pressing issues with all of the other produce to harvest and cook – I’ll learn that later (but please share if you know any). 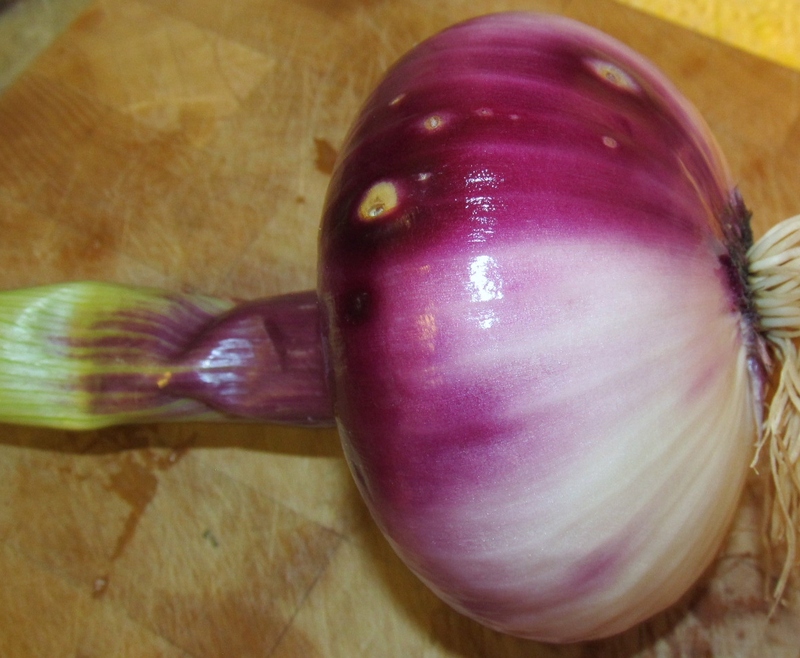 I grew white, yellow and purple onions. Soon, I will pull them out for curing. You can use whatever sort of onion you have on hand. 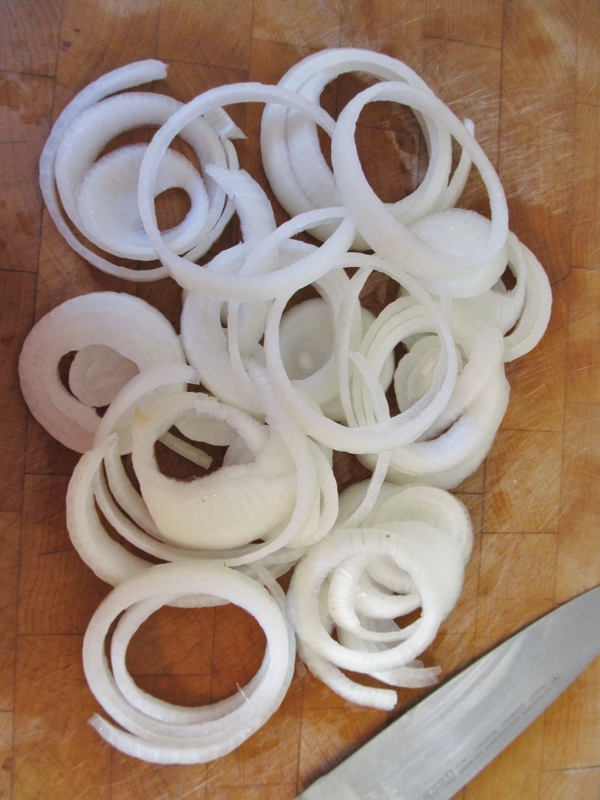 Slice it up into rings, about half an inch or so and use the whole onion because it’s going to shrink down. Next, heat up a small skillet to medium heat. After it’s hot, add some EVOO (extra virgin olive oil) – enough to mostly coat the bottom of the pan – and let it warm up. Add the onions and season with some salt and pepper. You can also drizzle a little EVOO over the top, but they don’t need to swim in the oil. After they start to soften, turn the heat to a low-medium heat. Keep it low and cook it slow! You’ll notice the onions starting to brown – that’s the carmelization! I promise they’re not burning, as long as your heat is low. If you’re worried, turn it down a bit more. The dark color is the caramelizing process in action! Keep an eye on them, but go about your business doing other kitchen tasks and just give them a stir now and then. They will keep getting yummier and yummier. You’ll also notice that they are shrinking up, too. Again, that’s ok and it’s part of the process. 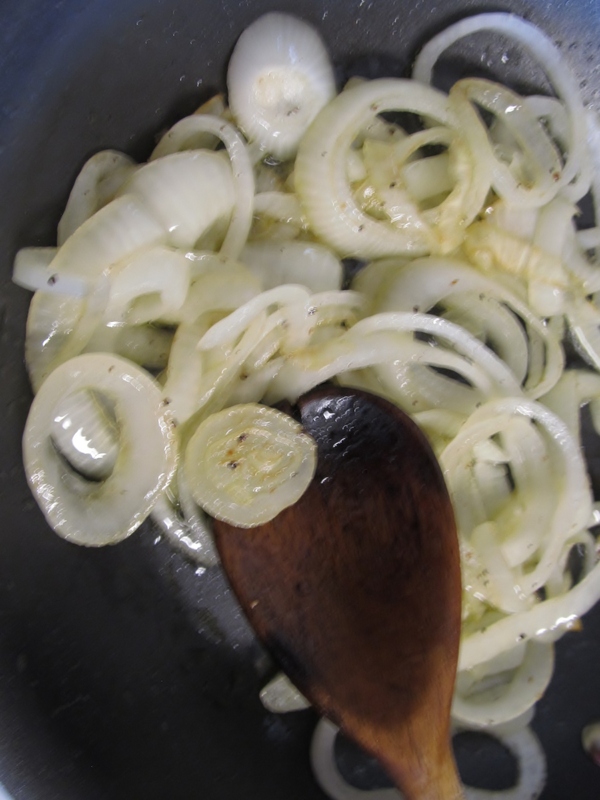 Usually, it takes about 25-30 minutes to caramelize an onion, but it will depend on how thick your slices were when you started, and your cooking temp. No, cooking at a higher temp will not make the process faster because they will crisp up and burn. However, like my first try, you can cook them at a super low temp for longer to squeeze even more yummy out of them. I find the 30 minute mark is about right for my tastes – oh yeah, make sure you have some tasters along the way! When they turn a deep, dark CARAMEL color, they’re done! That’s all there is to it! So heap some on your burger or your brat and experience a whole new level in taste-ology. But, stay tuned because I have some upcoming recipes that take the caramelized onion beyond the brat and burger – way beyond. In the meantime, experiment by using them in recipes that you might ordinarily use regular boring cooked onions in and see how it improves the flavor. Simply stirring in some chopped veggies, like zucchini, broccoli or peppers – or green beans! Or mushrooms! (so many options), at the end of the caramelizing step and cooking for a few more minutes would be an easy, flavorful side or even main dish……Or… roasted potatoes would be fabulous with these onions! I could go on..but you get it. Ok, now you know the process and I’m sure I’ve convinced you that you must make some caramelized onions NOW, but it gets better. How? When you’re cooking the onions, pour in a little BEER (like 1/4 cup) and let it cook down with the onions. Seriously – it takes the whole thing to an even deeper, more flavorsome place that you may never have experienced before. Do it. Oooooo…and I bet wine would also be a heavenly twist…. Leave a comment and let us know how you’re using caramelized onions. Categories: Cooking, Dinner, Garden, Sides, Veggies | Tags: beer, Caramelizing onions, Cooking, easy, food, Fresh, Garden, gardening, Grow, healthy, homemade, low-carb, low-fat, nutrition, onions, potatoes, recipes, simple, vegetables, veggies, wine | Permalink.